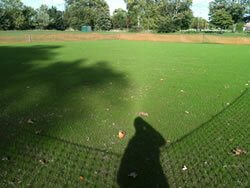 The cricket ground on Putney Lower Common is a source of turf management wonder. The location is beautiful, green and verdant, amazingly so given its proximity to central London. And the fact that it plays so well is mainly down to one man: Eddie McVarish. Eddie has toiled in his own time on the pitch and has produced a surface which has improved significantly over the past decade. Up until the late eighties, the players themselves, led by Eddie, were charged with delivering two playing strips each weekend. It is thought that the pitch deteriorated a little from the early nineties following the theft of the large hand pulled roller (probably for scrap metal value). The pitch has always been slow and low early in the season (never go back unless you see the ball rising above stump height) and there was a time when it could be a little naughty in the second innings. But, a decade ago, we bought the big sit-on roller and the quality improved greatly so that, when hard, some big scores were getting racked up and the First XI once proved that 310 could be chased down (Ed: it was Sheen Park did the chasing!). But, as with all things, investment is needed to better secure the future. The contractors swung into action towards the end of September and a did the needful over a couple of pretty wet days. 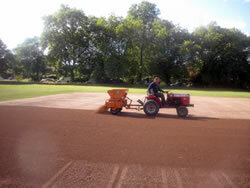 First was to strip off the first inch or so from the surface of the square using a Koro machine. Grass seed was then sown across the square and then a mighty seven tonnes of the finest Surrey loam applied (a mere 6mm!). In only a few days, the green shoots of recovery were visible and four weeks on we now have a lush covering of grass. Planning for the job done was a communal effort. A handful of folk agreed to underwrite the cost of the work so we were safe in the knowledge that the work would be done regardless of who would end up paying for it. Another handful of folk put their energies into some fundraising socials: a race night, a quiz night, the annual dinner. At the same time, we researched some grant applications. Local rivals Roehampton CC helpfully shared with us the name of the funder for the works on their square. We went through a fairly tortuous application process at the same time as rustling quotes from FineTurf and Kensett Sport, two turf management firms. 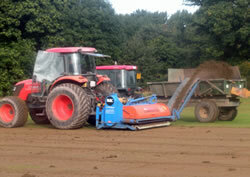 One was not only £1,000 cheaper but offered four tonnes of extra loam! In the end, the grant was awarded which itself paid for all the works bar the VAT of the cost of the works! Now, we have the high quality problem of what to do with the funds raised. The Committee has its ideas! So, what can we expect of our new playing surface? Without the thatch, we think a more consistent grass covering and a more uniform soil should lead to a quicker surface and more consistent bounce. We also think that it will be easier to maintain. So, a fine club effort to coalesce around a specific project which we defined, planned and implemented in pretty short order, perhaps a great template for future plans and ideas. The current pavilion was constructed in 1959, and has been modernised in recent years to provide excellent facilities for club members. There are two changing rooms, with ample hot showers. The bar area is bright and clean, and serves draught and bottled beers at very reasonable prices. There is also a kitchen for preparation of teas and snacks. The club prides itself on providing players of both sides with a good tea between innings. We have just constructed a new outdoor practice net next to the pavilion to allow training sessions throughout the season. We also have a bowling machine for specialised batting practice. The club runs three or four sides each weekend. On Saturdays two teams compete in the Fuller's Brewery Surrey County League. Half of the games are played at home, the away games are generally played within South West London or North Surrey. Matches are usually very competitive with frequent close and exciting finishes. The Sunday XIs play friendly matches, but enjoy competitive matches as much as the league teams do. There are several mid-week matches throughout the season, with a tour to Sussex and the Isle of Wight each July. During the winter nets are held at the Ken Barrington Cricket School at the Kennington Oval. Matches usually start at 1.30pm and finish between 7.30 and 8pm. After the games players are encouraged to spend some time in the bar socialising with team-mates and opponents alike. The club is about more than just playing cricket.